Fifteen riders took part in a sponsored ‘Tack Up and Mount Up’ competition at Westertoun Riding Centre, organised by Laura Galleitch. Their ages ranged from 14 years down to 6 years. 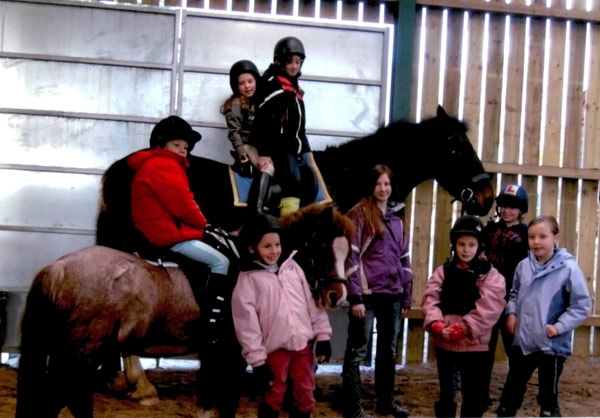 Each child was allocated a pony and given a designated time in which they had to have their pony tacked up, round to the school, and be mounted with stirrups and girth adjusted, with absolutely no help. The times allocated were between 6 and 20 minutes, depending on the age of the child, how difficult the ponies were to bridle and how long they had been riding. Laura says” The children were wonderful. They all rose to the occasion and achieved their goal. I am so proud of them. Between them they raised £465 for the Equine Grass Sickness Fund”.